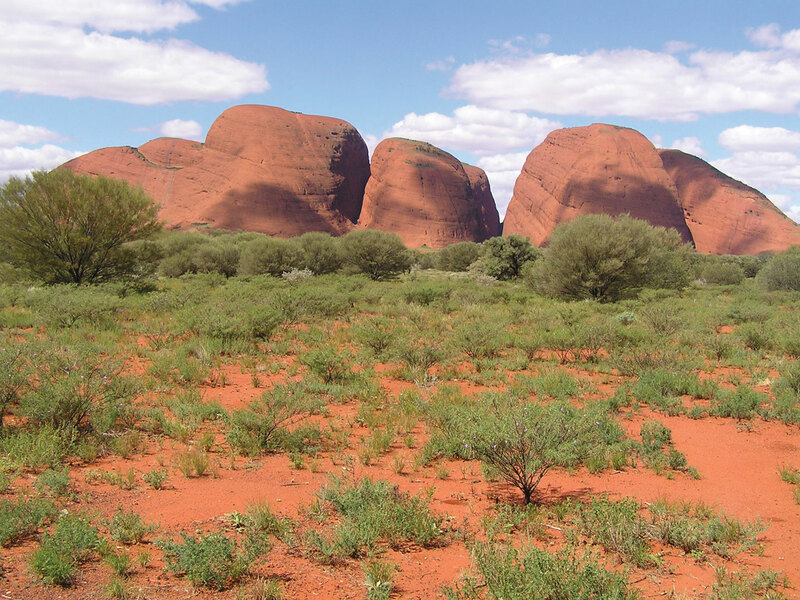 We'll pick you up from the airport or the Ayers Rock Resort, depending what time you fly in today before exploring the 36 rocky landforms of Kata Tjuta (The Olgas). In the evening, watch the sun set over Uluru with a glass of wine and a 1,000 star dinner awaits you back at camp. With the red earth beneath your feet and the starry sky overhead, sit down to a candlelit spread of local food and wine. Note: Total driving time today is around four and a half hours. Total walking time is approximately one hour. An early start this morning is rewarded with an Uluru sunrise. While the morning is fresh enjoy a walk around the base of Uluru, gaining insights into the land and the local First Peoples of Australia on an interpretive cultural walk to the Mutijulu waterhole with an Aboriginal and Torres Strait Islander guide. Once you’ve had lunch, perhaps purchase some art and craft of the First Peoples of Australia at the Uluru Cultural Centre. Travel onto the exclusive campsite within Watarrka National Park (Kings Canyon), where the group will eat and sleep for the night. Note: Total driving time today is around three and a half hours. Total walking time is approximately two hours. Put your hiking shoes on after breakfast and head out to explore the formations and towering rock faces of Kings Canyon. The sheer size of the canyon is breathtaking. Trek for 6 kilometres along the Rim Walk, which takes you through a natural amphitheatre, past the striped sandstone domes of the ‘lost city’ and into the green oasis of the Garden of Eden. Stop for lunch before making your way to a campsite on the homestead of Erldunda, where you’ll spend the night at the Desert Oaks campsite at Erldunda, where you can meet one of Australia most unique wildlife species, the Emu at the Erldunda emu farm. Note: Total driving time today is around three hours. Total walking time is approximately two and half hours hour. 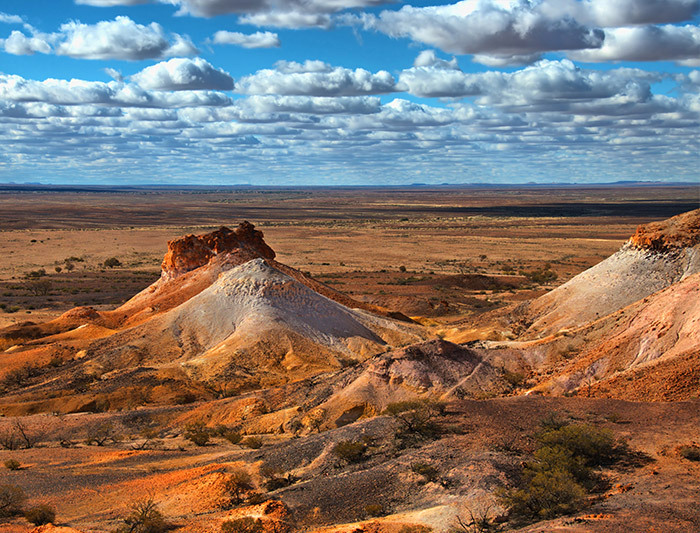 Depart early this morning and make your way to Coober Pedy, crossing the Northern Territory/South Australian border on the way (approximately five hours in total). Take a break to stretch your legs and enjoy lunch in the outback town of Marla. Coober Pedy is known as ‘The Opal Capital of the World’ and was one of the locations used to film the third Mad Max movie. Due to extremely hot temperatures in the area most of the town is constructed underground, with residents living in cave-like houses carved into the hillsides. Upon arrival, take a guided tour of the town, underground opal mine and museum. End the day hanging out with some rescued joeys at Josephine’s Gallery and Kangaroo Orphanage. Tonight stay in a multi-share underground bunkhouse in Coober Pedy. Note: Total driving time today is around four and a half hours. Total walking time is approximately half an hour. Today after breakfast we will travel into areas seldom seen by most tourists as we leave the sealed roads of the Stuart Highway behind us and travel on unsealed roads to one of the remotest towns in the world, William Creek. On the way we will travel through the largest Cattle Station in the world, Anna Creek. As we drive gaze out at the endless horizons as we pass by the lake with the longest name in the world, Lake Cadibarrawirracanna. Arriving into town we will set up camp and have dinner. After dinner lay down in your swag and fall asleep as you count the shooting stars. Note: Total driving time today is around two hours. Total walking time is approximately half an hour. Today will be a long day of driving as we travel the famous Oodnadatta track to Quorn. 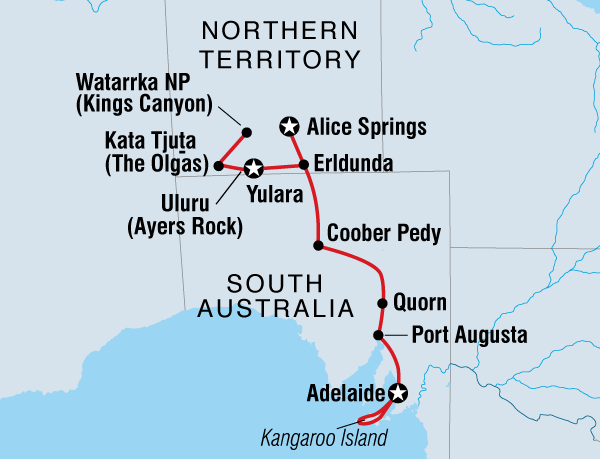 Along the way we will visit Australia’s Largest lake, Lake Eyre. 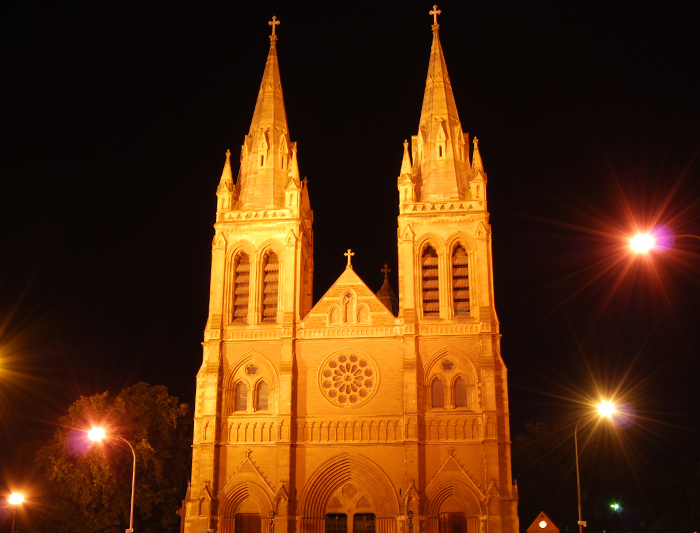 Visit the outback towns of Marree, Lyndhurst and Hawker. Stay tonight in private accommodation at the Mill Lodge tonight, where you’ll also have dinner. Note: Total driving time today is around six hours. Total walking time is approximately half an hour. 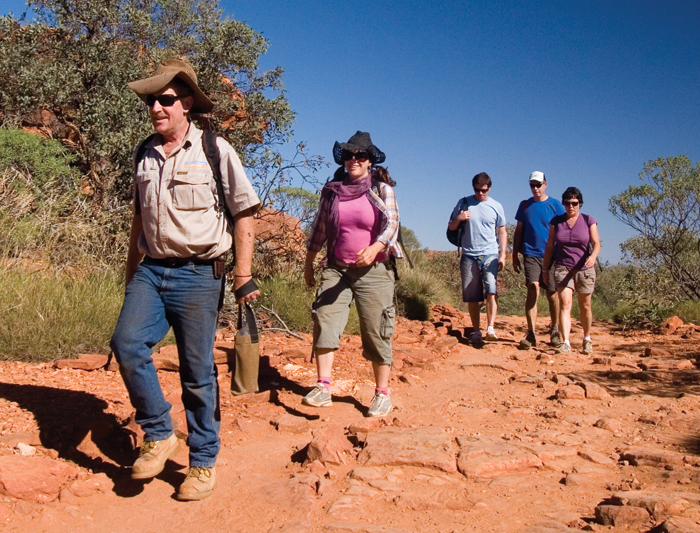 In the morning, eat a big breakfast and hike up one of the many peaks in the Flinders Ranges. Make your way back to Adelaide through the rolling hills and vineyards of the Clare Valley, arriving in the early evening. We will drop you at your Adelaide city accommodation, the Adelaide Central YHA for a good nights rest before you head off to Kangaroo Island tomorrow. Note: Total driving time today is around three and a half hours. Total walking time is approximately two hours.